DIE Martis, 9 die Octobris. Lives on Estates, for Discovery of, Bill. Message from H. C. with a Vote against French Commodities. 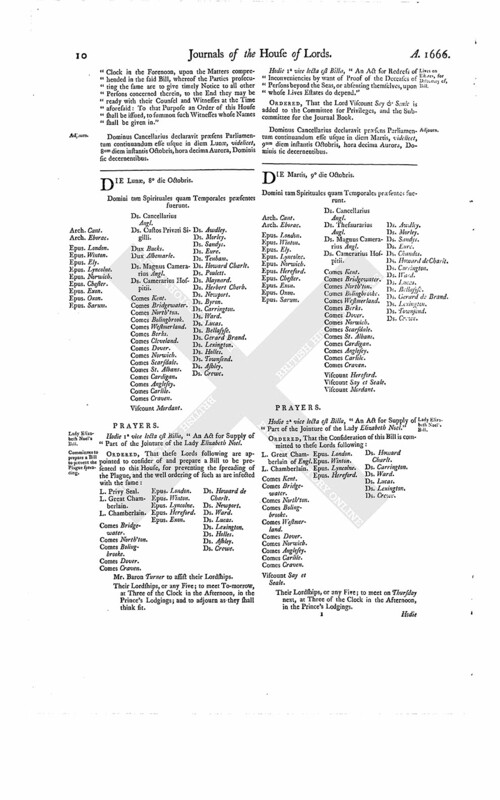 Bill to prevent the Plague spreading. Hodie 2a vice lecta est Billa, "An Act for Supply of Part of the Jointure of the Lady Elizabeth Noel." L. Great Chamberlain of Engl. Viscount Say et Seale. Epus. London. Epus. Hereford. Ds. Howard Charlt. Hodie 2a vice lecta est Billa, "An Act for Redress of Inconveniencies by Want of Proof of the Decease of Persons beyond the Seas, or absenting themselves, upon whose Lives Estates do depend." ORDERED, That the Consideration of this Bill is committed to the same Committee as the Bill concerning the Lady Elizabeth Noel; and the Two Chief Justices are to assist their Lordships. 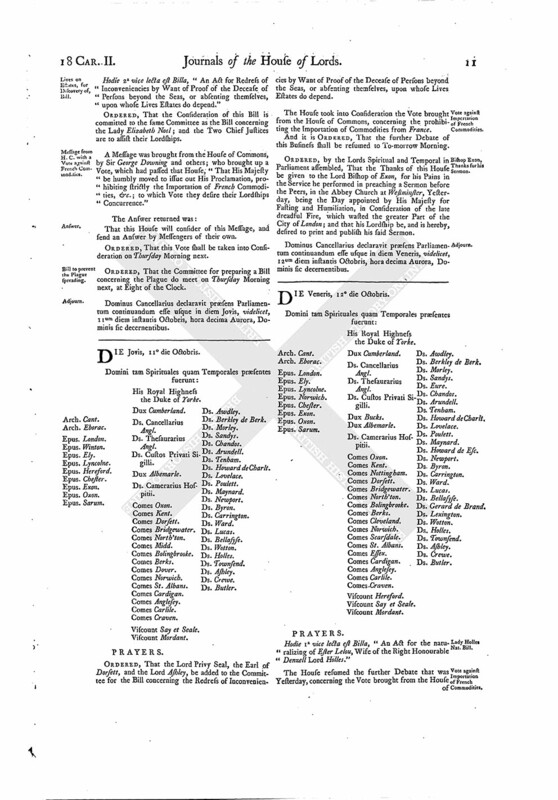 A Message was brought from the House of Commons, by Sir George Downing and others; who brought up a Vote, which had passed that House, "That His Majesty be humbly moved to issue out His Proclamation, prohibiting strictly the Importation of French Commodities, &c.; to which Vote they desire their Lordships Concurrence." That this House will consider of this Message, and send an Answer by Messengers of their own. ORDERED, That this Vote shall be taken into Consideration on Thursday Morning next. ORDERED, That the Committee for preparing a Bill concerning the Plague do meet on Thursday Morning next, at Eight of the Clock. Dominus Cancellarius declaravit præsens Parliamentum continuandum esse usque in diem Jovis, videlicet, 11um diem instantis Octobris, hora decima Aurora, Dominis sic decernentibus.